The EAS Sliding door operator is a sliding door operator system for all applications. Available in single slide, bi parting or telescopic, this operator can be installed in wide range of locations from large retail units with heavy footfall to smaller premises where space can limited. The slim and stylish sliding operator, only 100mm high, is installed on the transom above the door connected to the leaf with carriage wheels that run in the header. Available in silver satin anodised or polyester powder coated finishes. Installed with the latest in monitored activation and safety sensors and along with the systems self-monitoring processor EAS sliding door operators are safe, reliable and energy efficient. The sliding door systems are also fitted with emergency battery back-ups and fire alarm connection allowing them to be used in emergency escape routes. Telescopic sliding doors, available in both single and bi parting, are a real space saver, with two door leaves sliding in the same direction, stacking in the open position. This allows this product to be installed where a conventional sliding door is unsuitable due to space restrictions. The EAS Sliding door can also be fitted with an integrated electro mechanical lock within the operator itself allowing this to be ideal for secure entrances. The product is also compatible with any access control device from key pad or fob to video entry systems. Our sliding operators also allow us to retrospectively install into most existing sliding door headers/back tracks allowing you to upgrade old or damaged sliding doors in a cost effective way. Automatic sliding doors are doors that move across the plate of a fixed screen or wall. The door will sit in a closed position and it will slide open when activated by an activation device like a radar sensor or access control. Sliding doors are suitable for most environments where the space available will allow it. Sliding doors give a great first impression at the entrance to any building. Automatic sliding doors are also DDA compliant making your entrance very user friendly. Where do people normally install sliding doors? Automatic sliding doors are suitable in nearly all buildings and environments. EAS have installed automatic sliding doors in hotels, doctor surgeries, hospitals, shopping centres, office blocks and of course local shops. 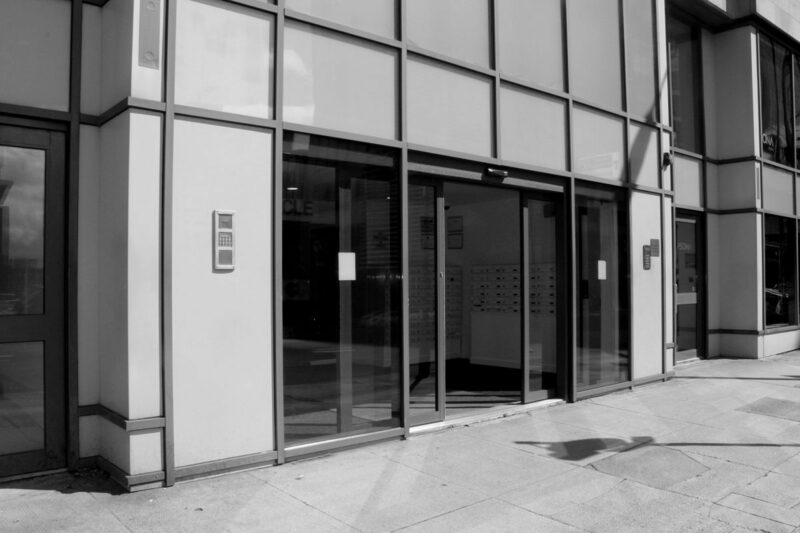 Where the required space is available,sliding doors are one of the most popular entrance solutions as they are affordable and reliable but also offer a stylish look for any business. The installation usually takes one working day, depending on the size of the project. However, Entrance Access Solution will always ensure that premises are secured by the end of the day. What doors can be converted into sliding doors? You cannot naturally convert existing doors into sliding doors. What you need to do is remove the existing swing doors and install a new aluminium liner frame to mount the sliding door operator on, however you can usually keep existing frames and windows. Entrance Access Solution can retrospectively fit a new automatic sliding operator into an existing sliding door back track (header). This will reduce the cost when it comes to updating old sliding doors. Even though you cannot exactly convert existing swing doors to sliding doors you can in most circumstances put sliding doors into any environment where the space will allow. What maintenance do sliding doors require? They’re very easy to maintain. There are only a few moving parts in a sliding door operator and they are very reliable. We advise you get your automatic sliding door maintained once every six months. One of our engineers will inspect any moving parts including carriage wheels and floor guides, that can wear over time. We also test all the electrical components and motor along with a BSEN16005 safety check. Automatic sliding doors are very easy to maintain and very easy to use. Is there any situation in which you would not install sliding doors? The only time that sliding doors are not really able to be fitted, is when space is an issue, because there needs to be a place for the sliding door to actually slide into. So, if space is an issue that’s the only sort of situation where you wouldn’t be able to install sliding door. With safety devices like presence detecting sensors and safety pocket screens that ensure the door will not come into contact with pedestrians, they are completely safe to be used absolutely anywhere. What sort of environment the doors are going into? The location for the doors to go? What sort of entrance doors are currently there? What type of activation devices are you looking for? We usually advise that we have a site meeting in order to discuss your user needs. If this is not possible we can give an estimate over the phone. Anything else I need to know about sliding doors? Sliding doors usually come in single slide, which is one leaf sliding either left or right or a bi parting sliding door with two door leaves moving in the opposite direction. Telescopic sliding doors are slightly different where two door leaves will be sliding the same direction and they stack up to one side in the open position. That’s a great space saver, so it limits the amount of space you require to allow the sliding leaf to fit into. Sliding doors can also offer great security with a wide range of manual and electric locking. There is also wide range of activation devices from sensors to push pads to access control devices that can be tailored to your exact needs.